A catapult is a device used to throw or hurl a projectile a great distance. During the Medieval period, when castles and fortified walled cities were common catapults were used as a key siege weapon against them. Catapults were gradually replaced by the cannon in the 14th century. 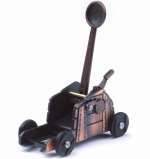 This Medieval Catapult is made from metal, with plastic wheels and has an exciting working firing mechanism. The catapult also incorporates a pencil sharpener. Pewter Cross supplied on a pin with clasp. The information on the reverse of the card describes Celtic designs and how skilled the Celts were at working metal. Pewter Cross with gem supplied on a pin with clasp. The information on the reverse of the card describes Celtic designs and how skilled the Celts were at working metal. An reproduction medieval coin attached to a key chain. A pewter cross with interlaced design with a gem in the centre, supplied on a quality key chain.